This is our first trip with Asia Air, and we have started to realise why it’s so cheap – we are packed in like proverbial sardines! Cannot relax at all but at the same time we are so tired. Quirky Gal is eating her favorite food, chocolate, for breakfast and loving it. Quirky Guy is busy setting up everything to record our adventures and about to eat his Twix. 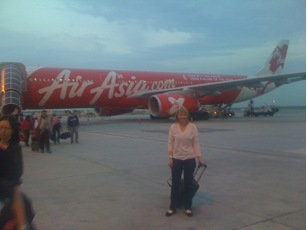 Soon we’ll land in Kuala Lumpur (KL) to meet my sister who is joining us on our trip. Quirky Gal and Quirky Sis (aka Denise) have a swimwear label called Birdies. 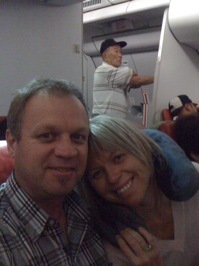 This is Quirky Sis’ first trip overseas, so I imagine it will be a big eye opener for her. We arrived in KL with no dosh and exchanged $100AUD for KL currency (later learning it’s called Ringgits). We stopped into McDonalds and had some breakfast – mostly because we could use the free Internet (although it was too slow to really be worth the effort). What we did learn is that after Quirky Guy was able to get phone connection and SMS Quirky Sis, we had to go to the other side of the Airport to Concorde Inn. Well you thought that would be easy…but after being told it was 150r to get to the other side, we checked the Internet and found it was another 5r each to catch the airport bus. We finally caught up with Quirky Sis, splashed some water on our face and had to catch the shuttle back to the airport for the train to town. Yes, another wait. We then had to work out how to get a train to KL Central to see the Petronas Towers. Waited some more. So much for that train! Still 7km from the centre and Petronas! Another wait and another train and we finally get to the station. We looked and looked for the towers…finally found them and turns out we were inside them the whole time! We took some happy snaps and now off to China town. Time gets away from us, so we’re now rushing to get back to our bags and to the airport. More delays on the return, so getting to the bags was a feat! The biggest problem was “Do we or don’t we?” Do we use the shuttle back to the airport and then the bus to the cheap side of the airport (Air Asia)? Do we try to catch a shuttle direct to the cheap side? Or do we take a taxi (and risk more waiting)? Help! What exactly are the Petronas Tower? Sounds great, welcome to the world on international travel. Basically they were the world’s tallest towers until some other construction surpassed them in 2004. Incredible.